The ability to change the Windows LIVE ID associated with and Xbox LIVE account. The description pretty much says it all, but choosing this option changes the Windows Live ID associated with your Xbox LIVE account. It will also transfer all your Microsoft points to the new Windows Live ID as well. Here are some screen shots that show what this looks like in the dash. 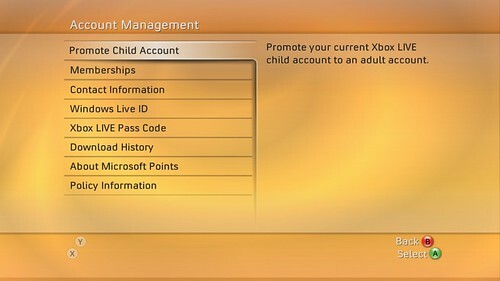 Promote your Xbox LIVE child account to an adult account. Here are some screen shots that show what this looks like in the dash. Another new feature that may be of interest to some: this update will also allow Under-18 Xbox LIVE members to now use Messenger on Xbox 360.